Well in some cases it does help to be a bit delayed in getting news out as sometimes numbers do change and fluctuate especially when subscription numbers are mentioned. Yesterday, Mordor or Bust posted an article from the PatriotLedger which originally stated 200K new LOTRO subscribers since the F2P announcement – but that has since been clarified to be 100K-200K beta applicants, via Turbine. Now, while not quite as impressive as new subs, when you consider that subscribers were automatically signed-up (and hopefully not counted in this number) that’s still a pretty good sign of new blood to the game. So my thoughts are this will be a pretty substantial influx of new folks to the game and some portion of those will certainly transfer over to subscriptions, or buy things through the cash shop, which will bring new revenue and resources to Turbine. Most people peg the current subscription base around 250K to 500K for LOTRO (still hard to figure out) this will most likely mean about a community twice the size it currently is. Which yes, will bring some annoyances but will all the tools we have to get around those, I’m more excited for all the cool people who will be joining us! The other piece of news lately that has stirred some commotion was the article over on Massively where they get to sit and chat with the Turbine folks about the new toys and such coming with Enedwaith. If you haven’t read the article, I highly suggest it but I figured I’d share my thoughts on what we’ve learned so far. There seems to be lots of focus and effort on helping people learn the game. From the re-works to the intro tutorials and the UI tweaks I think that will be a big help for people just hopping in to the game. Plus hopefully they’ll get to some of the annoyances us current players have. The whole instance thing is exciting, assuming they don’t screw it up. I like the idea of an “instance join” mechanism and of course the scaling mechanism. Now the scaling is similar to Skirmishes but you can’t change the group size, only the level of the instance. They’re also breaking up some of the longer instances into wings, which was part of the initial confusion as these were quoted as entire instances when in fact it is just a part of one. So far I’m all positive, the scary part for me is the rewards as I want these instances to be rewarding and not just diversions. I don’t expect to get the highest tier radiance gear but I want stuff that could actually benefit my character and not another skirmish mark grind for runes and relics for my LIs. And finally they did talk about Enedwaith which everyone should be happy to learn is a happier more open place! It is a large zone with a pretty good amount of quests (over 160) so this should provide a nice alternative for folks who are scared (or tired) of the dark. It also is the continuation of the epic story which I’m quite addicted to and can’t get enough of. I also found it interesting (not knowing the lore) that we’ll see quite a few different Middle-Earth cultures including men and hobbits. Also, there’s a race specific quest line mentioned which will be interesting as well to see how that plays out – sadly I only have men so I’ll need others to fill me in on what I’ve missed. Nothing but positives from the news side of things for me, but there still are lots of unknowns so we’ll still have to wait and see how everything fleshes out. This entry was posted in General, LOTRO, Raids and End-game and tagged beta, End-game, Enedwaith, epic line, Equipment, Expansion, Free to Play, Legendary Items, Lore, LOTRO, Mirkwood, radiance, raid, runes, skirmishes, volume 3. Bookmark the permalink. 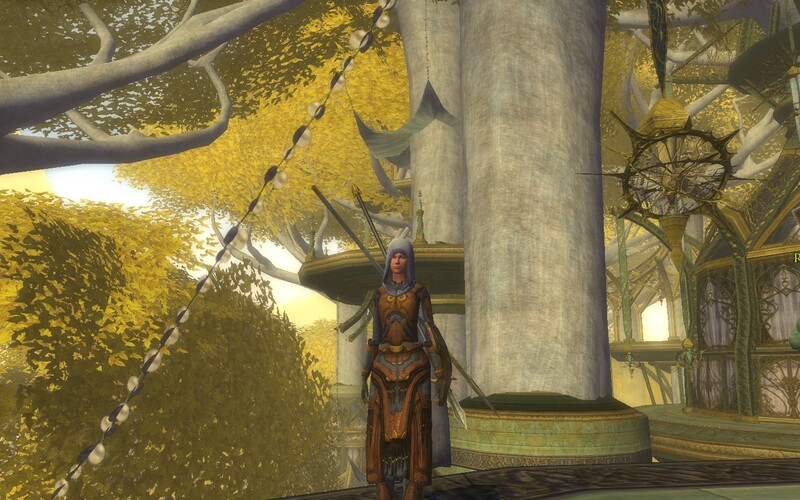 I had played lotro over a year ago (I got stuck in the high 30’s and couldn’t seem to find enough quests to make my way out, any suggestions you have would be welcome) but after hearing about F2P, my wife was interested, so we played a day of the free trial before she got her own copy and I resubbed and got the expansions. So at least in our case, it’s working out quite well! Great to have you (and your wife) back! Sadly that level range probably is still the toughest in the game from a content perspective. Although things are a bit smoother then they were previously. At that point, either Eastern North Downs, Evendim, or the Trollshaws are all areas of possibility. Angmar is also possible depending on the class but it can get a bit dicey. Also, skirmishes really help supplement content as you can mix them in with the normal quest content and possibly jump over quest “gaps.” Plus since there are duo skirmishes that might work out really well for you and your wife – they start at level 30. Oh, a little update… I noticed an icon on my screen which told me that xp required to level had been changed, and as soon as I gained xp, it would recalibrate itself. Being one kill away from level 39, I assumed I’d get an extra half level or so, but ended up getting a full level plus two or three bars! Hopefully this will help get things moving along again. yeah, that’s from when they re-baselined the XP curve. For many it was quite a nice boost!